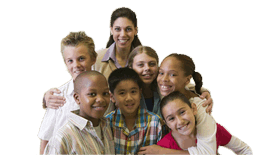 Challenging behaviors are a typical part of childhood development. When these behaviors arise, it is easy to fall into the pattern of telling children what not to do. However, with positive language, caregivers and teachers can create opportunities for children to be successful by telling them what they should do instead. Providing concrete examples of home and classroom expectations makes it easier for children to learn how to behave accordingly. Positive language can be used to nip behavior in the bud or as redirection in response to misbehavior. Take a deep breath and choose words thoughtfully. Challenging behaviors are frustrating. Taking a moment to compose emotions before addressing the child could be the difference between saying something constructive and saying something damaging. Use a firm but calm tone. State the expected behavior and give the child a chance to make a positive choice on his/her own. Acknowledge the child when they demonstrate the expected behavior (“Hey, I heard you say “please” when you asked your brother for the iPad. Nice job!”). Sometimes, a child will choose to continue misbehaving after redirection. Let the child know the consequence for misbehavior and still offer an opportunity take a positive route (“If you choose not to start cleaning your room, there will be no time for the iPad. However, if you start now, you will have plenty of free time.”) Make sure to follow through with the consequence, whether it is positive or negative. Although positive language can be used in most situations, negative vocabulary may still be required, especially if a child is in immediate danger or a situation must be resolved quickly. However, take a moment after the incident is over to address the behavior calmly and talk about possible solutions and expected behavior. Alyssa Nucaro from edutopia.org suggests the one-and-three rule: For every one negative statement in the classroom, there should be three positive statements. Changing communication styles takes time and practice, but word choice makes all the difference when addressing behavior. Try positive language today for a happier home and classroom!